You ask the spectator to blindfold you, or you turn around so that you can't see anything that the spectator is doing. You really do not see anything! You ask the spectator to create 5 piles of 10 cards each, so that 50 cards are in play. You tell her to make sure that there are 5 cards face-up and 5 cards face-down in each of those 10 piles. They can be in ANY order, and she is to do all of this ordering in ANY way she wants, without telling you (and, of course, you can't see anything that she is doing). You then let her know that you are going to separate each pile of 10 cards blindfolded into 2 piles of 5 cards each, with the same number of face-up and face-down cards. 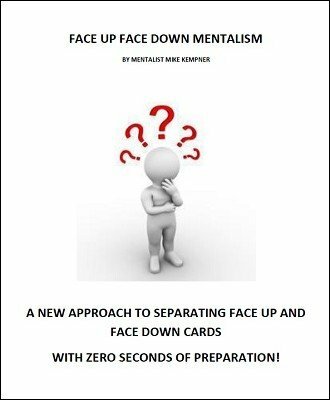 You tell her that, at the end of this process, you will have created 10 piles with 5 cards each, and each of the five pairs of piles will have the same number of face-up and face-down cards. You proceed to do the impossible, and after you have created the 10 piles, you have the spectator check each pile to make sure you did the impossible. You truly are hands-off, and the spectator indeed does confirm you were able to separate the cards accurately, EVEN THOUGH you didn't see anything.